The 2019-2020 FAFSA is now open and ready for you to file online. 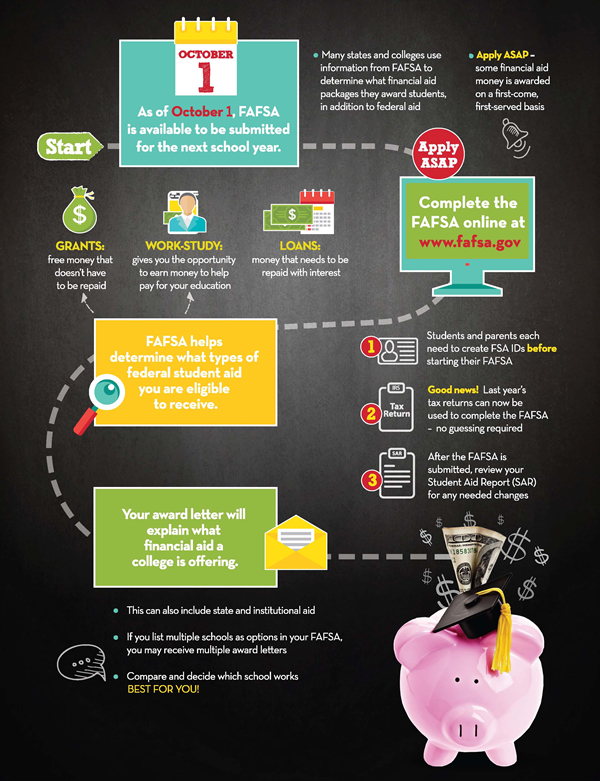 Filing for FAFSA is essential for students planning on attending college or career school. FAFSA first! is here to help make the application process as easy as possible. For your 2019-2020 FAFSA application, remember these two things. The FAFSA is available as of Oct. 1, 2018. File your FAFSA now, so you can receive financial aid award offers from schools sooner and make informed decisions about college or career school affordability. You can use your 2017 Income Tax Return information. The process is easier because you should already have your 2017 income tax information. You can even use the IRS Data Retrieval Tool to import your tax information directly from the IRS website into your FAFSA to avoid errors. Use these reference guides to help you complete the FAFSA. Contact your high school counselor for additional help. The FutureMakers Coalition developed this campaign to increase FAFSA completion among high school seniors in Southwest Florida and create a culture of FAFSA awareness for both high school students and parents. Comprised of educators, workforce developers, business leaders, economic development professionals, government officials, residents and students, the FutureMakers Coalition is a collective impact initiative focused on bringing together stakeholders from throughout the Cradle-to-Career (C2C) Pathway. Their goal is to transform the workforce by increasing the number of Southwest Florida residents with degrees, certificates and other high-quality credentials by 2025.